This post is also available as a Jupyter notebook. You can download it or run it on Binder or Colaboratory. A surprisingly wide variety of interesting-looking vector line graphics can be generated with a fairly simple technique. First, we take a bunch of lines. These lines work best if they represent a pattern with some regularity, so I call them the texture. Then, we pick a surface, which is essentially an elevation map represented by a matrix of heights. It can be generated mathematically or taken from real data. Next, we map the texture onto the surface, and capture the heights along all each line to add a third dimension to those lines. Finally, project the result to convert the 3D lines back into 2D lines. If we're lucky, these lines will be more interesting to look at than the texture we started with. We'll use penkit's show_layer function for displaying plots within the notebook, so if the following code throws an ImportError, try running pip install penkit in a terminal. Let's begin by generating a texture. As I mentioned, a texture is just a set of lines. The texture in this case is simply a bunch of evenly-spaced horizontal lines. To simplify the math later on, it is helpful to constrain texture coordinates such that both dimensions are in the range [0, 1]. If you try generating your own (and I encourage you to! ), make sure they are within this area (you might find penkit.textures.util.fit_texture helpful). # returns a pair of matrices, which we will flatten into arrays. # we flatten them there is a separater between each horizontal line. # here that the pen should be raised between each horizontal line. Note that we represent all of the lines in two same-sized arrays: one of x-coordinates, and one of y-coordinates. Each coordinate pair creates a line from the previous coordinate pair, unless either contains a nan ("not a number") indicator, which represents a gap in the path. All coordinates are absolute, i.e. vectors from the origin rather than relative to the previous point. If you would like a more gradual introduction to this way of representing lines, see my Fractal Generation with L-Systems tutorial. If you count the lines, there are six of them, which is the parameter we passed as num_lines. You might have also noticed the optional resolution parameter and wondered why it matters. The lines above are actually made up of a bunch of line segments, and the number of these segments is the resolution. 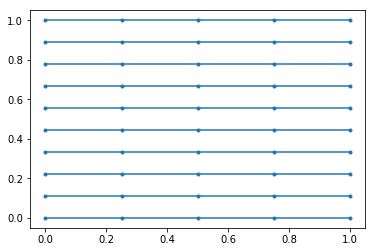 We can use matplotlib to make it clear where the line segments are. Try modifying the parameters to make_joy_texture to check your understanding. The resolution doesn't make a difference when we plot the texture, but soon we will be bending the texture into curves. The higher the resolution, the more accurate the curves will be. A surface is essentially just a matrix of numbers that we can interpret as elevations. 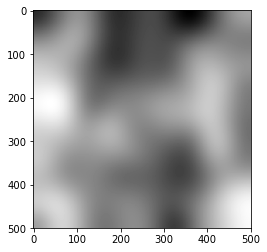 One way to generate interesting surfaces is to generate random noise and blur it. # will be generated every time the tutorial is run. 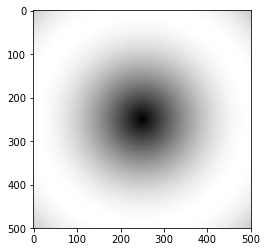 Surfaces can also be visualized with matplotlib, but we need to use imshow rather than plot. Lighter pixels represent points with higher elevations. These matrices represent smooth gradients along the horizontal and vertical axes, respectively. These will be the "raw ingredients" to our process. We can apply different functions to them to get different effects. Standard graphing functions, like sin, can be generalized into 3D by converting the (x, y) values into a scalar and calling sin() on that. The natural transformation into a scalar is the norm, i.e. the distance from the origin. Note that the x and y values are scaled between 0 and 1, rather than being the raw pixel coordinates. Another fun math function involves taking the product of the sine of both axis. 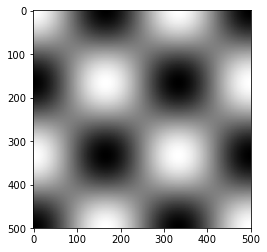 It comes out looking like a grid of bubbles, so I call it the bubble_surface. Now that we have a surface, we can map it to the texture. First we strech the texture over the surface dimensions. Then, for each point in the texture, we find its associated pixel on the surface and look up the "elevation" at that point. That elevation becomes the Z-value for the texture. We can think of these Z-values, combined with the original X and Y values, as making up a 3D version of the original texture. # the nan values to 0. # bounds of the surface, so we have to fix that next. # textures, so we silence warnings about this. To actually plot this 3D shape, we need to project it back to 2D. There are different ways to do this, but one way is to preserve the X coordinates, and use a linear blend of the Y and Z coordinates as the Y coordinates. Here's a function that handles both the mapping (by calling texture_map) and projection. # angle with standard trig. In both examples above, I've applied a scale to the surface by multiplying a number to the surface. Try modifying the multipliers and see what happens. Also, try modifying the angle parameter to other numbers between 0 and 90. You may have noticed that in the plot above, some of the lines cross each other. This gives the impression that the surface is transparent, as if we can "see through" it to lines behind the surface. In order to make images that look 3D, we can make the surface appear opaque by not drawing lines that would be obscured by the surface. One way to do this is by "masking" the visible parts of the surface. First, we apply the projection to the surface. Then, we walk over the surface keeping track of the maximum height as we go. Only the parts of the surface where the height of the sloped surface is equal to the (cumulative) maximum are kept. To understand this, consider a two-dimensional version below. The lines of sight are parallel, because we are using an axonometric projection. In this example, the lighter-colored parts of the surface would be masked out because they are hidden to the observer. If you trace the line left to right, you can see that points along the line are only visible if no point left of them is higher. In other words, they are equal to the cumulative maximum point. The same principle applies for our surfaces, but we have to do it for every cross-section of the surface. Fortunately, matplotlib has a function np.maximum.accumulate that calculates a cumulative maximum over every slice at once. By comparing the cumulative maximums to the actual elevation, we can determine the visibility of each pixel on the surface. The result of this function is a mask that tells us which pixels of the surface are visible. # the visibility at the desired angle. # the surface as closer to the observer. To apply the mask, we can set all values of the surface that are not in the mask to nan. The input and output of this process, as well as the mask used, are shown below. Putting it all together, we can apply remove_hidden_parts to a surface and get the result we want. Now that we have seen how projection works, let's explore some more interesting textures. If we swap the X and Y dimensions, our horizontal lines become vertical lines. By concatenating the vertical and horizontal lines, we can make a grid texture. Let's use penkit's rotate_texture function to play with the grid. Just as we scaled surfaces before by multiplying them by a scale factor, we can combine them by adding them. Let's combine all of the surfaces we've seen and map a grid texture to them. Try changing some of the values and seeing how the plot changes.